The Events Square at Chiswick Business Park was constructed in 2005 for the site's 13,000 employees to enjoy sports, concerts and functions. The clients requirements for an asphalt surfacing material was to be visually attractive and in keeping with a site that has won several industry awards for being a best-practice example of intelligent design. It also had to be durable enough to cope with heavy mobile machinery and as a loading area for heavy goods vehicles. Bardon Synergy is an asphalt material that can be manufactured to cater for a clients individual requirements. 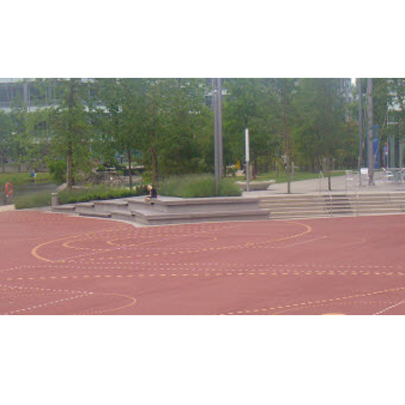 At Chiswick Park the client preferred a red material using red aggregate and to improve durability an enhanced binder was used. The material was installed at a depth of 25mm. The binder and base course were 20mm and 28mm HMB35 manufactured using recycled ingredients (i.e. incinerator ash, recycled glass and recycled asphalt) and installed to a depth of 60mm and 80mm respectively. A spokesperson for Aggregate Industries comments "The key to a successful application of a material as versatile as Bardon Synergy is to ensure that there is a precise understanding of any engineering or location issues that need to be dealt with at a design stage".